If you like the series that this game comes from, this is a great addition. 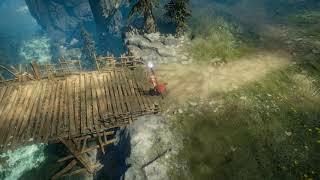 If you're new to the Heretic Kingdoms, you can jump in here and enjoy a great deal of fun ARPG gameplay! Disclaimer: This game was reviewed from a code we were given, thanks for the code! 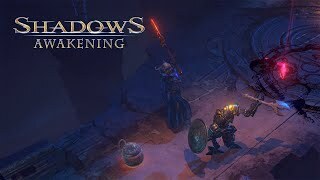 I'm a fan of Diablo-style isometric action adventues, I've played a lot of them, and I always come back to Diablo 3 for my fantasy ARPG fun. Lately I've been spending time with Warhammer 40K: Inquisitor Martyr and another iso-3d ARPG. A game that's one of the latest entries in the Heretic Kingdoms series of games known as: Shadows Awakening. When you produce a fantasy game of this calibre, you need some good voice talent, and the narrator/Krenze is a famous voice recognisable to all fans of Doctor Who. The Fourth Doctor, Tom Baker, lends his rolling voice talent to the game and provides a sense of gravitas to the character of Krenze. The game's story is interesting; it casts you in the role of a very different protagonist. One I've not seen used in a video game before really. You play as the Devourer, a demon summoned by Krenze for a purpose that I'm not going to go into. Play the game to discover the story. The Devourer is unique as demon-kind goes, for he can devour the soul of long-dead (or soon to be dead) powerful people and add them to his personal army roster. At the start you're given a choice between several heroes, but you can only devour one to use as your first puppet. Then, over time, and the game's story/side missions/exploration - you're able to get other puppets to join your crusade. Beware; some characters are locked out depending on the choices that you make. 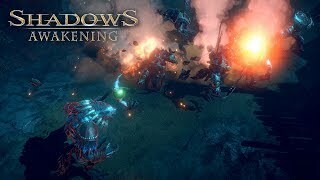 The game is a 3d isometric action adventure, with a fixed camera, and a plethora of unlockable characters which fill the role of: mage, tank, archer - along with the static demonic role of the Devourer. Each character you unlock gives you access to a range of skills that you can learn and equip to your character's skill tree. Along with a bunch of passive talents, which provide buffs and bonuses to your character and the group overall. Things like 25% extra cash, or bonus damage or defence against certain types of elemental attacks. You know the thing: standard fun RPG stuff. You can freely swap between puppets that you have access to in your roster, using 3 of them to round out the Devourer's formidable arsenal. You can equip them with a variety of randomly generated arms and armour, and find gear sets. Again, standard, but fun RPG fare. The maps are all hand-made, packed with puzzles and various secrets to uncover. There is also a Soul Reaver style 'dual' nature to the maps. Since the Devourer exists in the shadow realm, switching to him pulls you into that realm. Things that can't be seen are now visible, new monsters appear, new paths open and it's always wise to slip back and forth between both worlds to find every single secret and creature. In some fights you need to switch between both worlds to effectively defeat your foes. There's a huge sprawling main quest, and a ton of side quests to undertake. The game's world maps are huge, with secrets and hidden treasures packed in every single area. It's going to take anyone who likes to explore 100% quite a while to do. Plus, certain quests are only open to certain puppets and some of those you'll need to replay the game to see. Combat is fast, fun, frenetic and you need to keep an eye on your health meter. Use the left trigger to heal, and the right to restore mana for abilities and spells. There's ability cooldowns, and all the stuff that's baked into a Diablo-style game. It works, it works really well. Having to switch between worlds to defeat some enemies is a nice touch and adds a layer of tactics to the game. If a puppet dies they can be resurrected at a special zone called a sanctuary. If the puppets all die, and the Devourer dies, then it's game over. So you'll want to switch between worlds, heal, and manage all your resources carefully if you want to triumph. You'll want to get better gear, upgrade your puppets as you level up, and ensure that you're always evolving to meet the game's stiff challenges. Some of the early boss fights are downright painful at times. 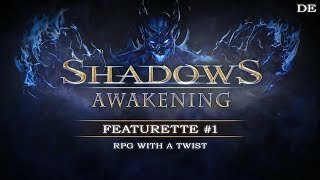 There's always a recommended level for a quest, and in Shadows Awakening - they mean it. I can't say I don't like the prose of Shadows Awakening, some of it's far too long-winded at times though, and laced with thee, thou, art, and so forth. Nothing wrong with that when it's at least written decently, as it is here. It's not in the mind-jarring bad way such as Two Worlds though, which is a blessing. It's delivered by a varied cast of voice actors, and some of them are better than others. I've a soft spot for the mage: Evia, who is haughty and badass all at once. Tom Baker steals the show, but I figured he might. The game has a few frame-rate issues here and there after extended play, less noticeable on an Xbox One X of course. For the most part it runs very smoothly and looks great. There's a lot of detail in the various environments and the maps all have their own theme that matches the area. Special and magical effects look decent. The sound and music design for the game is good stuff, the theme is nice and stirring, and there's a lovely sense of old-school fantasy to it. 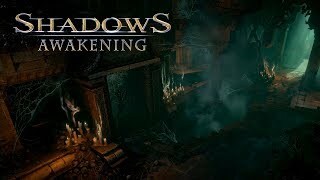 The sound design is likewise solid and makes good use of cues to deliver clues to certain things - like when you need to take a peek into the Shadow World with the Devourer. It's nice to see a 3d ARPG that's not made by Blizzard get the bombastic sprawling fantasy epic feel fairly right. There are a few things that grate (the purple prose for one) in the game, and there's not many bugs that I've been able to detect - no broken quest chains or triggers that failed. Everything has been smooth sailing barring the dropped frames now and then, and even they don't actually spoil the game. The dual world and puppet mechanics provide a big draw to the game for me, and I'm looking forward to seeing a lot more of the different characters as I progress through the huge game before me. There's a lot of dialogue to listen and read, so if you're into lore-rich worlds, you've come to the right place. The bonus here is that much of it is narrated by Tom Baker. Give it a shot, you might like it! As Nemesis the Warlock would say, "Credo!"